BlackBerry’s CEO says the tech giant will continue to test autonomous vehicles on Canadian roads and called on government to act after what’s believed to be the auto industry’s first death involving a fully autonomous vehicle. A Volvo, being used by Uber, was in self-driving mode with a human backup driver at the wheel Sunday in Tempe, Ariz., when it hit 49-year-old Elaine Herzberg, who died in hospital. 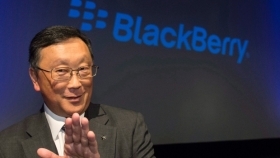 BlackBerry CEO John Chen said in a blog post on the company’s website that he is “saddened by the tragic accident” but that research and tests will continue. “This incident should serve as a powerful reminder of how high the stakes are for all of us working on the next generation of connected vehicles,” he wrote. Chen wants U.S. lawmakers to pass the AV START bill. It would allow for broader exemptions to federal vehicle safety standards and pre-empt some state and local regulation. “Its enactment will ensure that the industry can build the data sets necessary for the safe operation of driverless cars and provides policy makers with the tools to responsibly regulate the technology as it matures and ultimately reaches mass market readiness,” Chen said. However, earlier in March, safety advocates complained the Senate was rushing to please the auto industry without putting sufficient safeguards on autonomous vehicles allowed to operate on public roads.